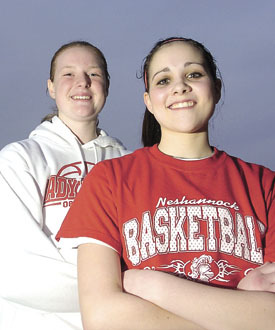 It was win or go home for the Neshannock High girls basketball team. With star senior Courtney Frengel sidelined since Jan. 5, the Lady Lancers went into the last week of the regular season needing a lift. Sophomores Chelsea Kauffman and Ericka Warvell gave it to them. “Courtney was kind of the team leader being a senior and averaging (17.1 points per game). When she went out, we struggled for four or five games,” Neshannock coach Greg Huston said. “It took a while for us figure out how to play without her. Warvell scored a team-high 15 points and Kauffman followed with 10 in a 40-37 nonleague win over Karns City. “We came out with a lot of confidence and everybody did their part,” the 5-foot-3 guard Kauffman said. The pair were at it again in Neshannock’s WPIAL playoff-clinching Section 2-AA win over New Brighton on Thursday. Kauffman led the way with a season-high 17 points and Warvell chipped in with 10 in the 50-38 victory. For their performances, Kauffman and Warvell are Lawrence County’s Co-Athletes of the Week, as selected by The New Castle News sports staff. The award is sponsored by Washington Centre Physical Therapy. Warvell has been Neshannock’s hottest gun since Frengel’s injury. Through 22 games (6-6 section, 11-11 overall), she is averaging 12 points with 27 3-pointers. “Ericka has worked hard,” Huston said. “The one thing with her is trying to figure out where she belongs on the court. The problem is she has played guard her whole life and works on her shot constantly, but she’s also the tallest girl we have. Kauffman, who didn’t score in double figures while Frengel was playing, has done so six times in her absence. She is averaging 7.9 points through 18 games. “She’s not the fastest, not the strongest and not the tallest, but she goes out there and gets the job done,” Huston said. “She’s always been like that. She’s a hard worker and a hustler. She’s tough; she weighs 100 pounds and she battled out there. One of the main reasons for their success as sophomores is because each got playing time as a freshmen. Kauffman averaged 5.4 points and Warvell followed with a steady 5 as both played in all 24 games last year. “Ericka was out there and she didn’t know where she belonged, this year she kind of found her nitch,” Huston said. “She’s come into her own. Huston also noted Kauffman’s improvements.